We offer a full winter maintenance service to private & commercial clients, 7 days a week, 24 hours a day. 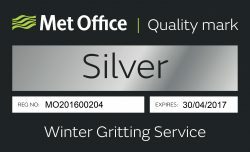 Working closely with the Met Office using years of gritting experience, allows us to provide a reasonable, accurate forecast and respond to immediate weather changes. If you are unsure if we can offer you a service where you, or your sites are located, then please don’t hesitate to contact us. A reliable, dedicated service you can trust. Drew Watson & his son John work along with a strong dedicated workforce who are committed to offering a full winter maintenance service when required. Our winter maintenance services can be provided 7 days a week through the night. Our business has been established for over 50 years, with many years of experience in winter maintenance. Our year is constantly focused on the weather, weather drives all our work. Whilst we focus on business issues, we pay close attention to environmental issues. provide an honest, loyal, reliable, local service. © 2019 Copyright D. Watson Gritting Services. Website design by L&H.